Trade shows enable prospects and customers see a side of you and your company that they can't see through your organization's website, brochures or social media posts – your passion and enthusiasm for your business. These face-to-face sales events can be highly productive, enabling you to promote your products and meet with a lot of key decision-makers in a condensed amount of time. Yet, your trade show strategy must be a thoughtfully planned and well executed to deliver meaningful results. Following are five key strategies by trade show expert B.F. Cornett, which will help ensure you get the most out of your trade show participation. Mentally rehearsing your event and trade show strategies can do wonders for your preparation. It will help you make a list of required materials and give you an idea of who to bring along. If you're the actual event planner, start out with some individual brainstorming. This will help you organize your thoughts before rounding up your team. Go through the entire process and jot down notes along the way. Think about the set-up process, what materials you'll need, what kind of inquiries you might get, how you'll manage your leads, etc. Click here for a planning timeline and trade show tools to help with this process. When you've done all that, it's time to gather your staff and start filling in the blanks. 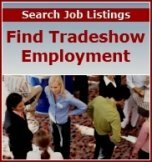 Choose your trade show team members carefully to ensure a good mix of talent. You'll want some of your outgoing personnel to handle booth visitors. And, you'll want some subject matter experts to help you respond to the more in-depth questions. Having the right people on hand can make the difference between capturing the big leads or losing them. Companies who are genuinely enthusiastic about their products or services pass that enthusiasm on to their customers and prospects. So as part of your trade show strategies before going to the big event, get your team into the proper mindset. Do some refresher training on your products or services so everyone will be comfortable discussing them. Prepare some talking points on how you're different and better than the competition. You should be excited to spread the word about your company's offerings. If you are it will show, and people will want to be a part of that excitement. There isn't a product brochure in the world that can take the place of a product trial. So whenever possible, offer some test spins, trial runs, or samples of your product or service. Trade shows give you the opportunity to showcase your product or service "in the flesh." Take full advantage of that opportunity. It's rare for people to actually sign up for services or purchase products at a trade show. Trade shows are more of an information-gathering event. The value of such an event comes from having the right approach and system for capturing the right type of leads on which you can follow up. And, at the same time, making a good impression so people might even follow-up with you. To help people remember your company, be sure to have some literature on hand or even information on a flash drive that you hand out. It's also customary (and helpful) to give away company-branded items like mugs, shirts, mouse pads or pens. Carefully select these promotional items so they have perceived value among your prospects without your blowing your exhibit budget. After a trade show, when the "dust settles" and the attendees are back home, they'll look through their materials to recall whom they visited. This is the golden moment when you want them to remember you.